small part of the core. The abs have very limited and specific action, and what experts refer to as the "core"
solid base of support. When this happens, we are able to generate powerful movements of the extremities. these muscle groups to be effective. and is often referred to as the "six-pack" due to it's appearance in fit and thin individuals. •Erector Spinae- This group of three muscles runs along your neck to your lower back. •External Obliques - located on the side and front of the abdomen. •Internal Obliques - located under the external obliques, running in the opposite direction. (muscles of your waist) and wraps around your spine for protection and stability. •Gluteus maximus, hamstring group, piriformis - located in the back of the hip and upper thigh leg. •Hip adductors - located at medial thigh. low back pain. Weak core muscles result in a loss of the appropriate lumbar curve and a swayback posture. Stronger, balanced core muscles help maintain appropriate posture and reduce strain on the spine. transverse abdominus. You should be able to breathe evenly while bracing and no hold your breath. can be done at home with no equipment while some require the use of equipment and gadgets. arguably one of the more advanced bodyweight exercises you can do. transversus abdominis, the hip flexors, the erector spinae and multifidus. ears to toes with no sagging or bending. Hold the position 15-60 seconds while maintaining control. strength and stability and keep the obliques and transverse abdominis strong. while maintaining control, and be sure to do both sides! holding it for 10 seconds while maintaining your balance. internal obliques. This exercise also engages the hip flexors. repeat several times. As you get stronger, hold the position longer. according to an abdominal exercise study done at San Diego State University. you will also find that it is a very powerful core strengthener. Start on your back, hands by your sides, knees bent and feet flat on the ground, directly under your knees. 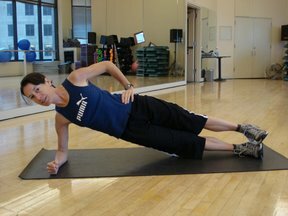 Lift up into a bridge position, and tighten your core. Slowly raise and extend one leg. Keep your pelvis raised and level, try not to let one side dip down. bridge as well, be sure to do both sides! the ground and then reverse it with the toes off the ground and your weight on your heels. Start in a push up position with each hand on a dumbbell (begin with a light weight to learn the movement). •Find a level place with enough room for about 10 full forward strides. •Begin by slowly skipping forward 10 strides (5 per side), stop and turn around. •For each return skip, gradually add more intensity and a larger twist to your strides. •Continue to add a full arm swing and drive your knees a bit higher. muscles to get the most from this warm up this exercise.